Joseph Robinette "Joe" Biden, Jr. (pronounced /ˈdʒoʊzɨf rɒbɨˈnɛt ˈbaɪdən/; born November 20, 1942), is the 47th and Vice President of the United States under the administration of President Barack Obama. He was a United States Senator from Delaware from January 3, 1973 until his resignation on January 15, 2009, following his election to the Vice Presidency. iden was born in Scranton, Pennsylvania, the son of Joseph Robinette Biden Sr. (1915–2002) and Catherine Eugenia "Jean" Finnegan (born 1918). He was the first of four siblings in an Irish Catholic family originally from Derry, Ireland. He has two brothers, James Brian Biden and Francis W. Biden, and a sister, Valerie (Biden) Owens. His great-grandfather, Edward F. Blewitt, was a member of the Pennsylvania State Senate. Biden's father had been very well-off earlier in his life, but had suffered several business reverses by the time Biden was born, and for several years the family had to live with Biden's maternal grandparents, the Finnegans. When the Scranton area went into economic decline during the 1950s, Biden's father could not find enough work. In 1953 the Biden family moved to an apartment in Claymont, Delaware, where they lived for a few years before moving to a house in Wilmington, Delaware. Joe Biden Sr. then did better as a used car salesman, and the family's circumstances were middle class. Vice President Joe Biden was born in Scranton, Pennsylvania, the first of Joe and Jean Biden's four children. His sister, Val, is his best friend to this day. 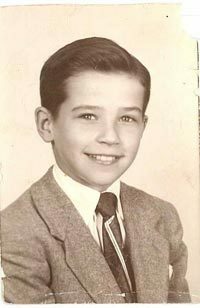 Joe Biden attended Saint Paul School in Scranton. "Kids make fun of you because you stutter." Eventually Joe Biden overcame his stuttering by reading aloud and looking in the mirror. "I have never forgotten what it was like and how tough it is for anyone who's had to face it. Overcoming my stuttering taught me one of the most important lessons in my life - that if you put your mind to something, there's nothing you can't do."